TB842 ModuleBus Optical Port is a communication interface between the CI801 or CI840/CI840A FCI and the TB820/TB820V2/TB840/TB840A ModuleBus Modem of an I/O cluster or ABB drives units via the Optical ModuleBus. TB842 connects to CI801 via TB806 and to CI840/CI840A via TU847 and TB806 for single I/O or via TU846 and TB846 for redundant I/O. TB842 can be used in both a simplex optical configuration as well as in a duplex optical configuration. In a simplex configuration, the optical ModuleBus nodes are connected in a ring. In a duplex configuration, the optical ModuleBus nodes are connected in a row. TB842 has a connector for fiber optic connections and a connection to the communication interface module. The module is equipped with Transmitter/Receiver for up to 10 Mbit/s. 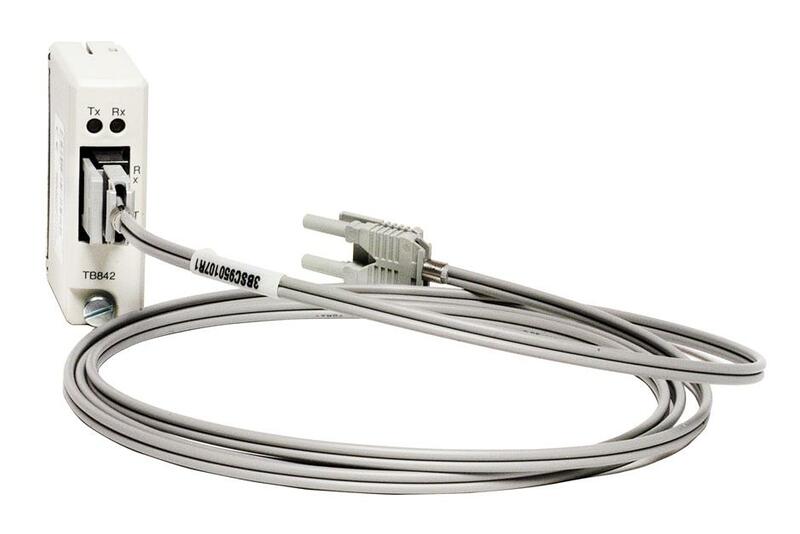 Both plastic and HCS (Hard Clad Silica) optic fiber with connectors (Agilent’s, former Hewlett-Packard, Versatile Link) can be used with the TB842. A Modulebus must have the same type of transmitter/reciever on each node. Opto Cable for TB842 according to HP. Plastic Optical Fiber (POF) (TK811V... or TK812V...) up to 15 meters. • Latching simplex or duplex connector. • Cable attenuation maximum 4 dB Hard Clad Silica (HCS) fiber up to 200 meters.